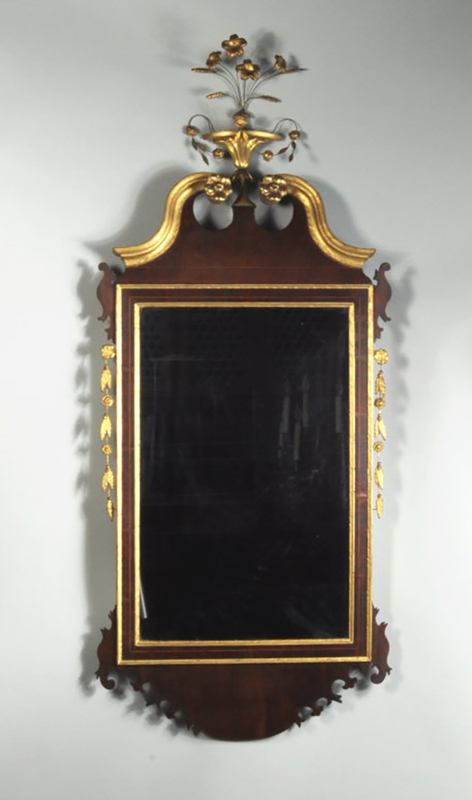 Thomas Schwenke, Inc. 50 Main St. North Woodbury, CT 06878 fedfurn@schwenke.com www.schwenke.com Hepplewhite Mirror Very rare hepplewhite inlaid and parcel gilt mahogany mirror, with arched swanneck top with gilded applied moldings with carved floral rosettes, centering an elaborate carved and gilded urn with spray, with cutout scrollwork ears and gilt carved foliate and leaf side ornaments, with elaborate and unusual cutout base. Connecticut or New York, circa 1795-1800. 57 1/2" high, 24" wide.